I’ll have to admit that in the past, I’d never really been a fan of the Brooks line of trail running shoes. One of the first things I do with a shoe when I get hold of it is bend it in half. If I can’t do that, I pretty much throw them out the window. I love a shoe that is highly flexible and will allow my foot to do what the hell it likes. I’m the kind of guy that likes a minimalist shoe, but with a bit of protection underfoot for those hard packed trails we have here in Australia. When picking up the Brooks shoes of running friends in the past, they failed the ‘bend test’, so I steered clear in the main. However the nice guys and gals at Brooks got in touch with our backwater little website and asked us if we’d like to try to Pure Grit 3. I did a quick search online and saw that this looked like it could be my type of shoe. As many of our readers will know, I’m a bit of a Nike Kiger fan boy. Those bad boys are so versatile that I can run 50km sockless trail races in them, right up to doing my weekly speed work in them too. In fact, you could argue as to whether or not they really are trail shoes, such is their diversity. So it was with great anticipation that I opened up the Brooks box to see the Pure Grit. I immediately bent them in half and I thought to myself, “These are going to go into a head on collision with the Kigers.” They ‘bend’ the same, they’re similar in weight and price, and they also look like I could easily go sockless in them. Would they stack up against the Kigers? Pretty much the first thing you notice about these shoes is the grippy hexagons that dominate the outsole of the shoe. These bad boys are built for tough trails that are technical or where you really need a lot of traction underfoot. Compared to the Kigers, they looked streets ahead and I’ll be honest with you, in this department they are. I don’t wish to hark on about the Kigers, as this is a Brooks’s review, but man does that outsole wear down after a while. 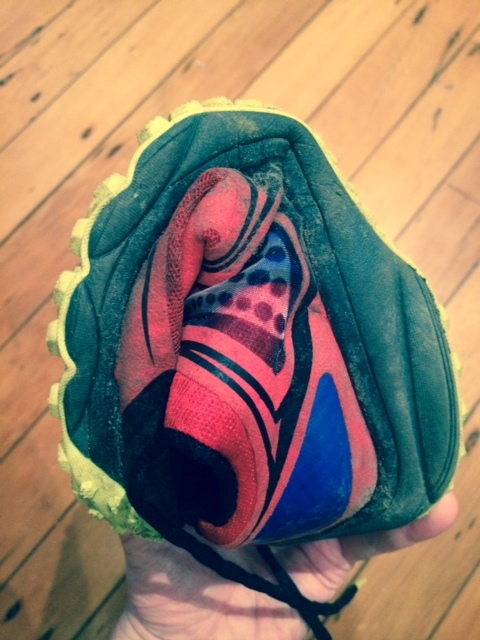 They are great shoes, but if you’re going to fault one area of them, it’s the outsole grip which just seems to wither and die post 100kms or so on those shoes. I don’t feel as though I did the Kiger review justice as even though I put around 10-12 hours into the shoes, it needed some more to showcase how that grip just wears away. So learning from that I’ve put a good 30 hours into the Pure Grit 3s, and man do we have a great outsole here. I’ve been on wet, muddy trails, hard rock surfaces and dusty, technical single-track. The Brooks have really stood up to most conditions I’ve thrown them at and I must say that I’m really impressed with what they’ve done down there. 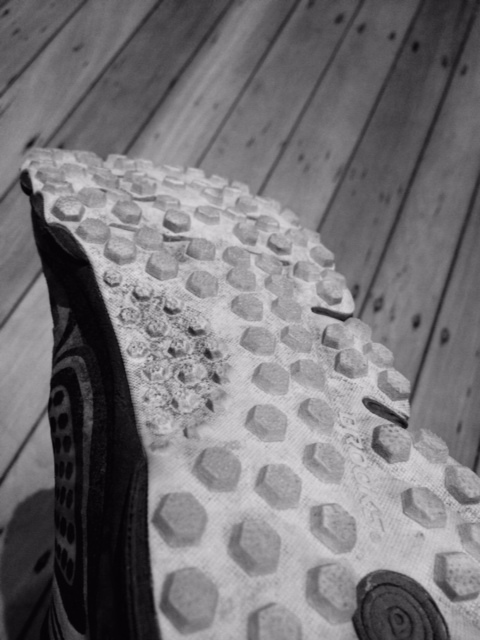 Some reviews I’ve read have complained that mud gets in between the hexagons of the shoe, which can cause them to become a little slippy. It’s not something I experienced, but I can see how this could happen. The ideal hunting ground for these shoes really are dry technical trails in the mountains. However, we almost didn’t get to this point of going beyond my first run with these. I have to admit I almost threw them to the back of the shoe review testing. You see, when you’ve been wearing the super spongy Kigers that seem to bounce you along the trail, the cushioning of another shoe pails into insignificance. My first ‘ride’ in these felt very ‘tinny’ in comparison to my Nike sponges, probably due to the rock guards, which are non-existent in the Nikes. I was having to work harder in these and behaving like a spoilt child who had been given the keys to the sweetie shop by Nike, only to find that Brooks had emptied the fudge section. (Fudge is a bit of a favourite of mine). But as I drew the run to a close, I gave myself a slap around the face and told myself to try harder, just like those masters at school all those years ago back in little old England told me. So I persevered, and I realised that there is more to life than spongy Nike cushioning and that there was a lot of enjoyment to be had by having to work that little bit harder, but being rewarded with superior grip. ‘Downhilling’ in these shoes along Kedumba Pass in the Blue Mountains was a joy. For those that like to know, these also have a rock shield to protect your tootsies from rocks and roots on the trail, as well as a toe guard that provides protection and added traction. Additionally, check out this video Brooks made if you really want to hear all the marketing jargon, like ‘responsiveness’, ‘connects you to the terrain’ and ‘redesigned from the ground up’. It’s so bad, it’s good – and please, a plea to all shoe manufacturers – normal people don’t say things like ‘from the ground up’ and ‘propulsion blade’. We say things like, ‘they feel cool when I bomb down the trail’ and ‘they grip well when I climb uphill’. Like the Kigers, the upper in the Pure Grit is extremely soft and you can (and I have) gone sockless in them. I’ve only taken this up to an hour thus far in these, but time will tell if they will allow you to get through a 4-5hr run blister free. Not that this is a massive concern of course. I tend to go half a size up on trail shoes as I like to have the room for my toes to move about and these didn’t disappoint at all. 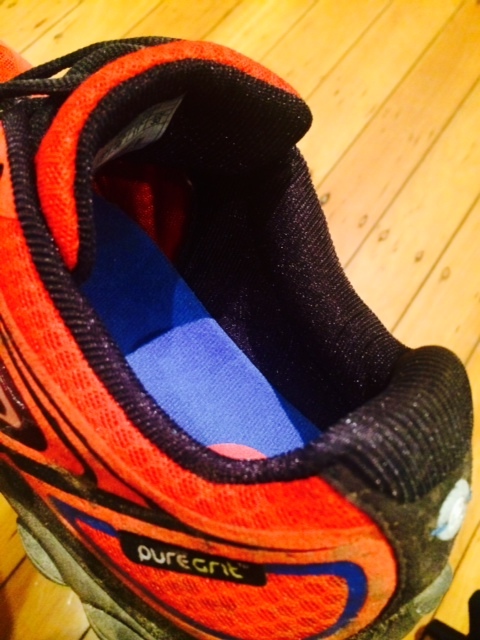 The toe box is pretty big and the general ‘ride’ is one of comfort. However, there is a big ‘but’ with the upper on these. The tongue of the shoe has this tendency to slide down to one side. At first I thought I’d tied the shoelaces up a little too tight when I felt this rubbing on the top of my foot. So I paused my run and saw that the shoelace was running right across the top of my foot because of the fact that the tongue had slipped – this was after around 3 hours of continuous running on a long run. I readjusted, but then 20 minutes later, the same thing happened. Now, for me this wasn’t a massive issue as my run was 4.5hrs long, but if I were doing a 100km or 100miler in these, this would be a big concern. Thinking I had a duff pair of shoes, I took to the Interwebs to see if this was a common complaint or not and I did find a couple of reviewers who had mentioned a similar thing happening. Now to date, this has only happened to me once, so I do need to take them out for another run of around 5hrs or so to see if the same thing happens. Lord knows why the tongue decides to slide off to the side like a drunk propping up a bar, but it seems that 3+ hours of running makes it a little worse for wear. Despite this however, the rest of the upper is great, so the jury is out on ‘tongue-gate’ until we’ve had another smash on the trails. Overall, I do like this shoe. I didn’t at first because I spent far too long comparing it to the Kiger. It’s hard not to when they so similar and are aimed at the same kind of market. That is those that want to start moving to a more minimalist style of shoe, but with the added protection underfoot to save your feet from a massacre of jagged edges. They also both feature a 4mm tread too, so now, when it comes to my long runs in the mountains, these two sit side by side as I make my shoe decision (#firstworldproblems). If I’m looking for a bit more grip and stability then I go with the Pure Grit. They give me everything I need from grip to comfort, but there is this nagging question mark over the tongue. If it is an issue, then it’s something Brooks needs to address as it will be a deal breaker for those runners that race in the 100km+ category. You do not want to have your shoe laces ripping a line into the top of your foot for the best part of five hours. I do like these shoes though. I really like the hexagon things on the bottom that give you a lot of confidence on technical trail to go that little bit harder, particularly on single track. These would be a good choice for shoe for something like GOW100s, for something like Glasshouse 100 with open fire trails, I’d go with a Kiger, and so you can start to see where the differences come in. I have been running with Pure Grit 1 for quite a long time. Loved the feedback from the terrain and the possibility of my feet to move and bend as I liked! Also the comfort was great and I concluded 2013 edition of GH100 km feeling very comfortable all run long. On the other hand I didn’t like the grip offered. For 200 or 300 km it was not bad but after decreased noticeably. On very technical trails (here in Japan they are pretty “bad”) I was not very confident in their grip. Reading this good review I will definitively give it a try with the hope that the feedback remained good as the first model. Thanks a lot, really like ultra168! !